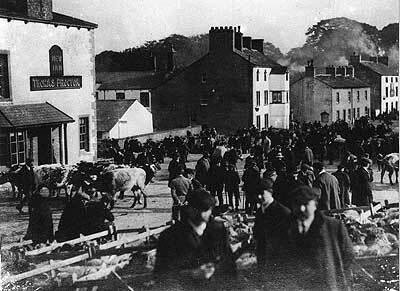 This scene depicts cattle going to market in a Lancashire village, many years ago. It was a day out for many people (more of a fellas scene I should think) who liked to visit cattle markets as people still do today. The farmers drove their cattle and sheep to markets over many miles and used dogs to help drive them, usually Border Collies down the flanks, sides, and Lancashire Heelers driving the herd forward from behind, nipping the heel's of the cattle (without breaking the skin) this is how the name Heeler came about.